Compared to the modern canon of classic cocktails you drink the rest of the year (the Old Fashioned, the Daiquiri, the Negroni) that can be dated back to the 1800s, the margarita doesn’t begin showing up on bar counters until much later -- well into the 1930s and '40s. The actual origin of the margarita has been obscured (one too many margaritas, perhaps?) but it is not surprising it began showing up when it did. Thanks to the budding smuggling trade from Mexico into America during Prohibition and the scarcity of European brandies and spirits during World War II, tequila was becoming more common in bars across the country. 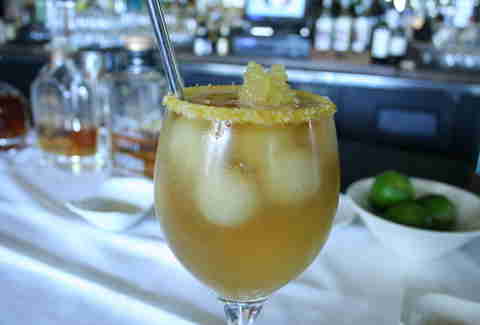 Arguably the most popular in the class of cocktails known as “the daisy”, an old-school cocktail category that uses spirit/citrus/flavored sweetener, versions began showing up in America shortly after the repeal of Prohibition. 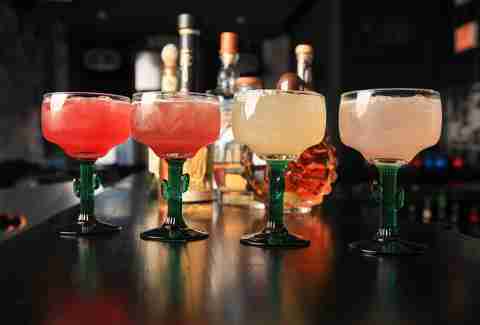 Travelers, fresh from a not-at-all-shady jaunt to the border, were impressed with the creations of an Irishman, who ran a Tijuana bar and had accidentally invented the “Tequila Daisy” one evening after grabbing the wrong bottle (if you are to believe one of the many origin stories). Familiar recipes can be found as far back as 1937 with the Picador, which was published in London in the Cafe Royal Cocktail Book. 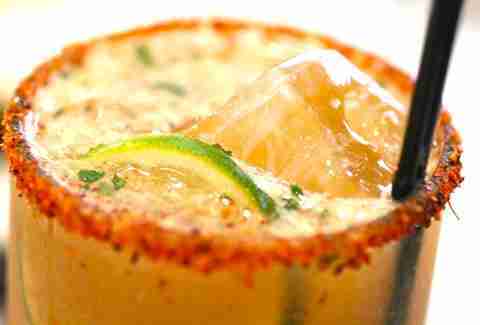 This concoction is made with tequila, Cointreau, and lime -- no salt. Kyle Ford, mustachioed mixologist for Remy Cointreau, noted, “This is the earliest printed curiosity that I've come across in my quest for the origin of the modern day 'classic' margarita. Interestingly enough, the Picador has been rarely discussed. [This cocktail], for all intents and purposes, is a 2:1:1 margarita.” The bigger question remains: how did we almost let the English beat us to the creation of one of the world's most famous cocktails? Perhaps the most popular origin story was first printed in the December 1953 issue of Esquire and credits Dallas socialite Margarita Sames with the invention during a Christmas party at her home in Acapulco. The story goes that, after several unsuccessful attempts to please her thirsty guests, she combined her two favorite ingredients, tequila and Cointreau, with lime, and her guests enjoyed it so much that they named it after her. But that version claims it was made in 1948 and, by that time, there are already references to a drink called the “margarita” in a few advertisements and on a select few menus South of the Border. 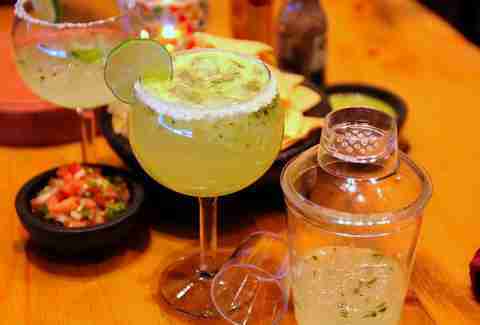 Either way, the margarita didn’t actually gain notable popularity until the '70s, with the invention of the world's first frozen margarita machine in 1971 by Mariano Martinez, a Dallas restaurateur and patron saint of Spring Breakerz. It was created in response to an overwhelming demand and inconsistency with his blended margaritas. Inspired, as one generally is at the sight of a Slurpee machine at a 7-11, Mariano modified a soft-serve ice cream machine, boosting the sugar level of the mixture to counter the freezing difficulty of alcohol. 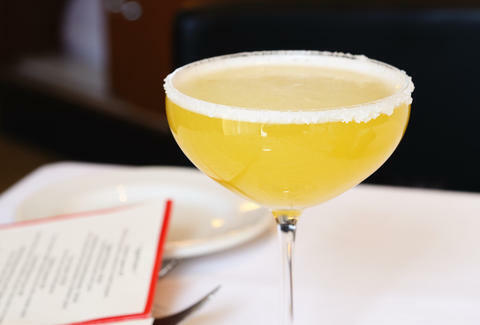 Another variation that has popularized itself is the Tommy’s Margarita, named after the San Francisco Mexican restaurant where the cocktail originated. This version replaces orange liqueur with agave nectar for a sweeter twist from the same plant the tequila is made from. Whatever your specs (the 7:4:3 standard proportions set by the International Bartender Association, the 3:2:1 used by cocktail expert Gary Regan, or the 2:1:1 ratio found in the early daisy), the ingredients remain the same: tequila, orange liqueur, and fresh lemon or lime juice, shaken and served in a glass with ice and a salted rim. Any deviation from this classic formula, and you've got full creative license to quote Doc Holliday from Tombstone, and say, "You're no daisy. You're no daisy at all." Nick Bennett is the bar captain at NYC cocktail bar Booker & Dax and Thrillist’s cocktail correspondent. He prefers his margaritas with salt on the rim and paid for by somebody else. Follow him @TheNickB for cocktail recipes and knowledge you didn’t know you wanted.